If you're like me, you don't have The Sundance Channel and you buy each episode of Big Ideas on iTunes for $1.99. I downloaded the last episode called "BUILD" and liked it so much, I'm going to buy a copy of the video on iTunes for the first 5 people to comment in this post. It's really good. In an information-packed 25 minutes and 38 seconds, the producers take us through Michelle Kaufmann's prefab factory, the process of building a Glidehouse, Carlton Brown's green multifamily housing in New York, the advantages of green building, the future of green building with technology, and Mitchell Joachim's fab tree hab. Note - I'll use the email that you comment with to gift the episode to you through iTunes. This is not a Sundance promo, this is JG promoting modern, green building. Wow what a generous offer! I haven't seen Big Ideas yet (no cable) but I am particularly interested in this episode. It sounds fantastic! It's almost too bad the these programs are only on Sundance (I can't get it on my cable either) where more people can see it - like PBS! I too, was impressed by the show. Wished there were more East Coast ideas. Started wondering how I could get a GlideHouse to DC. Very cool - thanks. 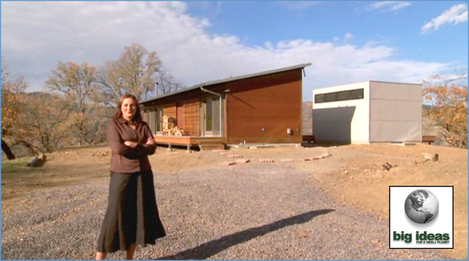 Also, Green Builders (or aspiring ones) should check out the Building with Awareness DVD. Great instructional info, and inspiring result. Michelle's plant was cool! I also learned something from the process that seems so elementary now. That they finish the house from the inside out. Meaning that they put up the interior drywall and finishes at the same time the plumber places his fittings on the outside of the wall. If you didn't catch it, Michelle makes a quick mention of it when explaining the process. Carlton's work is very inspiring as well. Couple that with the host's (her name escapes me) closing monologue, very thought provoking. Congratulations Steph, Michael, Bill, Andrew, and Adam! The video is in the email. Steph - I think you'll like it. Michael - you're right, Design: e2 is really good. Bill - actually, there is a Glidehouse in DC right now, at the National Building Museum! If you have a chance, go check out the exhibit. As for getting one of your own out there, it's a little tougher. MKD is pretty approachable, so if you're serious, call 'em up and talk with them about some options. Andrew - I need to check that DVD out, I haven't seen it yet. Adam - I liked Carlton too. I've been trying to post about more of the lower-income, sustainable projects because everyone, no matter where they are on the economic pyramid, deserves to live in a well-designed, healthy home. Peter over at Prefabcosm agrees that Build is a must-see stating, "The Build episode is definitely worth a watch, at least for a view inside the Michelle Kaufmann factory." An architect friend just told me about this episode, so I went searching since we don't have the Sundance channel either. I can't wait to watch the episode in iTunes, thanks for letting us know it is there!